The flag of the Borough of Phoenixville, Pennsylvania, is dark blue with white application of the borough seal on it. 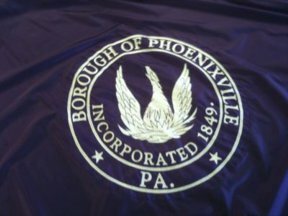 The seal shows a phoenix in the flame and "INCORPORATED 1849", encircled by the words "BOROUGH OF PHOENIXVILLE / PA."
Photo of the flag thanks to Henry Wagner, Borough Council President. "Phoenixville is a borough in Chester County, Pennsylvania, United States, 28 miles (45 km) northwest of Philadelphia, at the junction of French Creek with the Schuylkill River. The population was 14,788 at the 2000 census." - from Wikipedia: en.wikipedia.org/wiki/Phoenixville,_Pennsylvania.